India is blessed with astounding natural beauty and tonnes of legends and myths. There is no dearth of natural wonders in the country. These enchanting wonders are awe-inspiring and truly magnificent. Let’s have a look at some of the Incredible Natural Wonders. Mawsynram, a village in the Khasi hills of Meghalaya is the wettest place on Earth; this village receives an average annual rainfall of 11,873 millimeters which is the highest level of precipitation recorded in the world. It has also found a spot in the Guinness bBookof World Records for the same. The Lonar Crater Lake in Maharashtra’s Buldhana district is around 50,000 years old & was created by a meteor impact during the Pleistocene Epoch. It has been listed as National Geo-heritage Monument. The crater bears a saline water lake which has a diameter of 3900 feet. The Loktak lake located at Bishnupur, Manipur at a distance of 53 km from Imphal, is known for its circular floating swamps (called phumdis). The lake rich in flora & fauna was declared a national park. The sea recedes by as much as 5 Kms & fills up again during high tides twice a day, every day at the Chandipur beach in Odisha. This place is not just enchanting to the observers but also offers an opportunity to literally walk into the sea. South Asia’s only active Volcano located in the Barren Islands in Andaman & Nicobar. The Barren Volcano had been dormant for 150 years; it has come back to life since Jan 2017 becoming the only active volcano along the chain of volcanoes from Sumatra to Myanmar. The Great Rann of Kutch is known for its vast expanses of white landmass stretching across India’s western frontier is the only salt marsh in South Asia covering around 10000 square miles in Gujarat and the southern of Sindh in Pakistan. 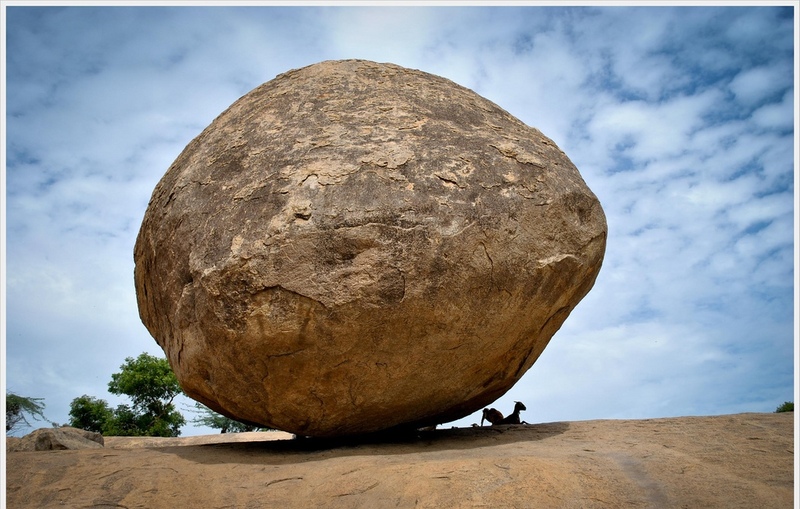 This 250-ton gravity-defying rock in Mahabalipuram called Krishna’s Butter Ball or Vaanirai Kal (Stone of the Sky God), looks like it’s going to roll any moment but has been sitting on a 45-degree slope for more than 1,300 years. This pristine waterfall called Dudhsagar, meaning a sea of milk is located on the Mandovi river at the Karnataka-Goa border. It tumbles down the cliff and meanders under the rail bridge and then snakes along its bed through the Bhagwan Mahaveer Sanctuary. The Magnetic Hill located near Leh, in the district of Ladakh. The geography of the area around this hill is such that it creates an optical illusion that cars on the hill roll “uphill” defying gravity while they are actually moving downhill. Located in Uttarakhand, this valley is covered by a carpet of colorful endemic wildflowers & with blue skies & snow capped mountains in the background. The Valley of Flowers is best visited between the months of March and September when it is in full bloom. Ram Setu is the mythical bridge that was believed to have been built by Lord Ram, to reach Ravan’s Lanka with the Vaanar Sena. It is a chain of limestone shoals that is submerged under the sea across the Palk Straight between the island of Rameswaram in Tamil Nadu and the Mannar district in Sri Lanka. Situated along the banks of the Penna river in Andhra Pradesh, one can witness huge red rocks stretching as far as the eye could see at Gandikota. This gorge resembles the Grand Canyon in Colorado and is the only known gorge in India. The Shivling at the Amarnath Temple in Jammu & Kashmir that has been created naturally by the freezing of water which falls from the roof of the cave to on to the floor. This is the largest known natural Shivling in the world. 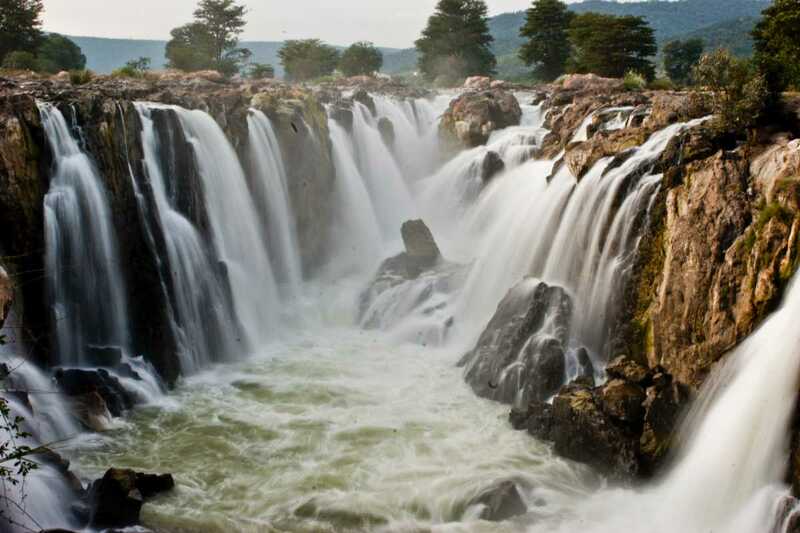 One of the most picturesque waterfalls of India, Hogenakkal Falls on the Kaveri River located in the Dharmapuri district in Tamil Nadu. It is located at a distance of 180km from Bengaluru and is known for the scenic natural beauty, boat rides & medicinal baths.